Fifa has recommended that its suspended secretary general Jerome Valcke is banned from football for nine years. The Frenchman was alleged to be implicated in a scheme to profit from the sale of World Cup tickets. 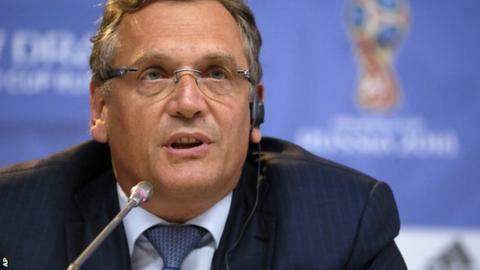 Valcke, 55, who also faces bribery allegations, denies any wrongdoing. Sepp Blatter, the outgoing president of world football's governing body, and vice-president Michel Platini were both suspended for eight years in December following a Fifa ethics investigation. A statement from the ethics committee also recommended Valcke pay a fine of 100,000 Swiss francs (£67,400) for alleged "misuse of expenses and other infringements of Fifa's rules and regulations". Fifa's ethics committee provisionally suspended Valcke from all football on 8 October for 90 days and on Tuesday - the day that ban expired - the organisation also recommended an extension of 45 days. That extension was confirmed by Fifa's adjudicatory committee on Wednesday. Valcke has been accused of being party to a potential $10m (£6.8m) bribe paid to Jack Warner, the former head of the North and Central America football governing body Concacaf, in return for his vote and backing to South Africa's successful bid to host the 2010 World Cup. When Valcke was Fifa's director of marketing and TV, he was released from the organisation in 2006 over a scandal involving its long-time sponsorship partner Mastercard. He was found to have negotiated with Mastercard's rival Visa in violation of the former company's right of first negotiation, a mistake that cost Fifa $90m (£61.3m) in a settlement. He returned in 2007 when Blatter appointed him secretary general.